$649.95 Seen a lower price? 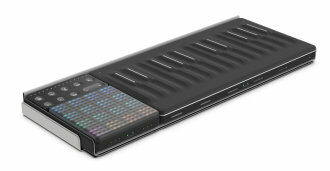 The ROLI Songmaker Kit gives you everything you need to create your track anywhere. Combine the expressive power of the Seaboard Block, Lightpad Block M, and Loop Block, and make your music with a kit that's more than the sum of its parts. Songmaker Kit comes with hundreds of sounds from funky synths to string sections to drums, including three signature soundpacks from world-famous artists: Grimes, Steve Aoki and Rudimental. They're all custom-made for 5D Touch. Expand your collection further with new cutting-edge soundpacks available to purchase every month. Enter the sonic universe of Grimes, the singer-producer who's redefined the boundaries between independent music and pop with albums like Art Angels. Explore Grimes' crazy modulated synths and original drums. From the delicate Ocarina of Thyme to the obliterating Subhumans, this soundpack is for adventurous producers who want to add exciting new sounds to their palette. Not only do the three Blocks connect seamlessly with each other -- they also integrate perfectly with a suite of software including Equator, ROLI's premium software synthesizer that's custom-made for MIDI Polyphonic Expression. The Songmaker Kit comes with a stylish, protective Snapcase. It holds the kit together and protects the Blocks when you carry them around -- so you can make music anywhere from kitchen tables to park benches.